Planetary Protection: X-ray Super-Flares Aid Formation of "Solar Systems"
Credit: NASA/CXC/Penn State/E.Feigelson & K.Getman et al. This Chandra image shows the Orion Nebula Cluster, a rich cluster of young stars observed almost continuously for 13 days. The long observation enabled scientists to study the X-ray behavior of young Sun-like stars with ages between 1 and 10 million years. They discovered that these young stars produce violent X-ray outbursts, or flares, that are much more frequent and energetic than anything seen today from our 4.6 billion-year-old Sun. The range of flare energies is large, with some of the stars producing flares that are a hundred times larger than others. The different flaring properties of the young Sun-like stars could have important implications for the formation of planets around these stars. According to some theoretical models, large flares could produce strong turbulence in a planet-forming disk around a young star. Such turbulence might affect the position of rocky, Earth-like planets as they form and prevent them from rapidly migrating towards the young star. Therefore, the survival chances of the Earth may have been enhanced by large flares from the young Sun. 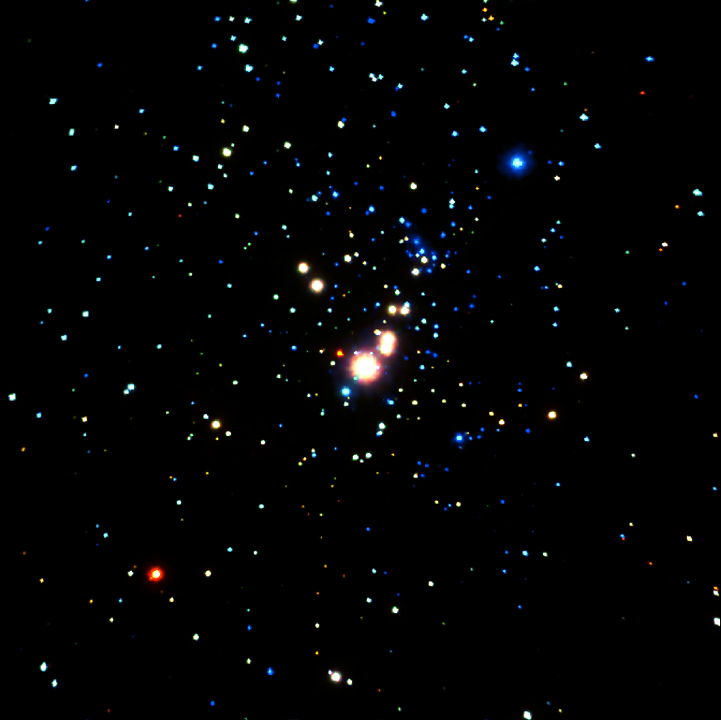 The different colors for the stars in the image are primarily due to the differences in the amount of gas and dust along the line of sight, which filters out the lower energy X-rays more effectively. Credit NASA/CXC/Penn State/E.Feigelson & K.Getman et al. Scale Image is 5.5 arcmin per side. Coordinates (J2000) RA 05h 35m 14.29s | Dec -05° 23´ 37.91"